After Kerala’s backwaters we headed east for the hill country. Munnar is set in the mountains surrounded by waterfalls and tea and cardamom plantations with cool, fresh air. It was most pleasant and turned out to be a perfect place to spend Christmas in India. Munnar is a small town in Kerala, though the surrounding area is generally all referred to as Munnar. After nearly five hours of driving from the backwaters, much of it rather jarring, we checked into Casa del Fauno, our home for the next four nights. I have included pictures below and details on the property in the Practical Info section. Sidebar: near Kochi there was a cop going up to every driver with a little brown box and asking them to blow into it. Random, low-tech breathalyzer, at 9:15 am. As I write this we have already visited Madurai and I am now in Mumbai, thus confirming how comparatively relaxing were our first nine nights in India! In Munnar, we did two half-day activities and spent the rest of the time reading (I finished 4-Hour Workweek and put a nice dent in The Kite Runner), writing, mellowing out and listening to Christmas carols. Sunday morning we were picked up by a jeep for a half-day tour up to the Kolukkumalai tea estate. The scenery was gorgeous but the ride was brutal. Bring Advil, and I think Jenni would advise doubling up on bras. We rode in a Mahindra, Land-Cruiser style jeep up into the mountains on some path that was a mix of dirt and large stones. You could not drive this route without a jeep or truck. Our driver was from the area and knew everybody. While most conversations I have observed seem to take three times as long as I’d expect, with our man it was the opposite. He would just quickly shout things out at pretty much every person we passed. And he LOVED the camera. He would offer to take a picture of us and then take five more of our surroundings, fidgeting always with the zoom. He was about making things happen, and I liked him. After climbing more than an hour, we arrived at a ridge with views across the cloud-covered valleys below. It looked like we were in an airplane, or Jurassic Park. Just beyond here is the aptly named Echo Point. The simple pleasure of a great echo is ageless. We passed by a few women working the tea plantation seated on the roadside for a food break, and they pointed out a couple nilgiri tahr at the top of the hill above us. The nilgiri tahr is a rare mountain goat found in these parts (see more in Practical Info, below). A sprinkling of back damage and touch of sore bum later, and we arrived at the tea factory. Kolukkumalai claims the title of the highest organic tea estate in the world. We took a tour of the small factory where the process still involves much manual work supplementing English-built machines dating back 50-100+ years. Converting tea leaves to tea is a seven-step process. I won’t bore you with all the details, but these steps are withering, rolling, sieving, fermenting (oxidation), drying, fibre extraction and grading. The withering takes place in long troughs upstairs where hot and cool air blows the leaves alternatively, after which they are fed into chutes and the remaining steps occur downstairs. On the way home we stopped for lunch for our umpteenth paratha (I’m sure you’ll read “paratha” many more times) and a little curry sauce. This cost Rs 75 for two! Putting a curse on me? The whole tour we did not see any other white folks. Munnar is a popular destination for middle class Indians looking to escape the heat and enjoy the hills. After we returned it came up that Jenni and I had each taken a liking to this song but hadn’t said anything because we didn’t think the other would understand. Jenni did a little internet sleuthing and found a link. Kind of corny but so soothing…enjoy! Jenni was ecstatic playing this over and over that afternoon. That night we made new friends (a man from Thrivandrum living in Beijing, and two of his friends) and a group of locals regaled us with Christmas carols, Indian style. I knew that Kerala had more Christians than most of the country, but I did not appreciate the extent. On our backwaters boats were pictures of Jesus, ditto the jeep’s mirror ornament and we have seen many churches. Casa del Fauno constructed a manger for Christmas Eve. We also heard “So This is Christmas” by Celine Dion the first few times on Casa’s stereo. Casa had maybe eight different holiday songs that they kept playing, but none more so than Celine. Monday we walked the cardamom plantation with Anoop, the kind and soft-spoken property manager. Cardamom grows in bunches of plants which themselves produce bunches of pods close to the ground. After harvest the pods are dried before being sold at wholesale. The property and surrounding area also include bananas, mangos, coconuts, hibiscus, jackfruit, coffee and several flowers. It is most lush and beautiful. While on the tour we also saw their lily-graced reservoir, Anoop pointed out a recent elephant footprint that was about the size of four basketballs, and we met some ladies breaking for food who were so warm and friendly. Anoop told us the workers get paid Rs 250/day plus food, accommodation and school for the children. We continued down the road and passed a man with his goats speaking on his mobile. Then we left the pavement and crossed a hillside with ancient pygmy rock houses before ascending some steep rocks to reconnect with a different road. A handful of smiling kids and kittens later, we returned to the Casa and later enjoyed a perfect sunset over the hills. I enjoyed the food at our hotel and fell in love with this spicy pickled mango sauce. Also, there was an endless supply of crisp papadums each lunch and dinner. Tuesday we relaxed and had a bottle of mediocre Four Seasons shiraz before/with our Christmas Eve dinner. We met a fun family from England and the mood was jovial with a warm fire (wood and a coconut shell towards the end) and many fireworks. One of the staff threw those loud poppers until the whole bag was gone. Jenni had the honor of cutting the fruit cake, and the stars were excellent. But the highlight was definitely good ole Celine. After Anoop had played So This is Christmas twice in the span of three or four songs, we eyed him going back to fiddle with the stereo. I gave Jenni the fist clenched, elbow tucked “yessssss!!!! !” sign and he saw me, then proceeded to play Celine again. Caught red-handed he came over and smiled and said sheepishly “I like this song very much.” It was adorable and we had perhaps our best laugh of the trip. We departed on Christmas and the staff insisted on taking pictures with us. The drive down to Madurai was beautiful and spirited, on a rough mountain road with many hairpin turns and areas where landslides had covered half the road with rock or simply made half the road disappear. Plus, an elephant crossing sign. Munnar was beautiful, lush and relaxing. Often I had to remind myself I was in India. If you are looking for a stereotypical Indian cultural experience this is probably not the place, but to see a calm and peaceful side of this amazing country it is a good choice. Transport: From our backwaters stay a bit south of Kochi, it took four hours by car to reach the town of Munnar and another 45 minutes to Casa del Fauno. We paid Rs 3,400. The last 1/3+ of the drive is on winding and often rough roads. There are buses to Munnar but I do not think a train, and you will need private transportation to get around the area. As all over India, your hotel or guesthouse can likely arrange tours and local and onward transport. If given the option, it might be worth having your destination arrange the transport as that increases the likelihood your driver can find the place. Accommodation: Your first key decision is whether to stay in the town of Munnar or the surrounding areas. Munnar itself did not appear particularly charming but may have more budget options and offer a convenient base for exploration. If you want more attractive environs, I recommend staying outside of Munnar. We stayed at Casa del Fauno which is about 25 km beyond Munnar (coming from Kochi), closer to the town of Chinnakanal. It was a (modest) splurge as we wanted a comfortable, peaceful environment for the holiday. Casa del Fauno is a restored bungalow on the Peak Gardens cardamom plantation. There are three rooms in the main house and some cottages just downhill. The main house is lovely and cozy with nice hardwood floors and high wood ceilings and a wood-burning fireplace. It felt like being in a friend’s home. Our first three nights we stayed in the Deluxe Room in the main house which was spacious and opened to a common patio overlooking the small lawn and valley and mountains beyond. This had already been booked for our fourth night and we were promised the Elegant Room also in the house but instead (for the same price) we got the honeymoon bungalow. This was similar to our Deluxe Room but slightly larger, more private and with a large terrace overlooking the hills. WiFi is only available in the main house, and may only work effectively in the Deluxe Room which is next to the router. Breakfast is included and freshly made tea or coffee is available throughout the day. Tasty Keralan lunch is served for Rs 250 and dinner costs Rs 500. If you want alcohol you need to request it in advance and someone will go to the store to purchase it. Casa del Fauno does not take credit cards. We also considered staying at Windermere Estate, Anearangal Camp at Suryanelli, Siena Village and British County (run by the Tourist Desk with offices in Kochi). Siena Village is well-reviewed though we passed the property and it is more in a town vs. Casa del Fauno which was really set in the forest. Nearby our hotel are The Wind and Spice Tree. Our driver also mentioned Club Mahindra. 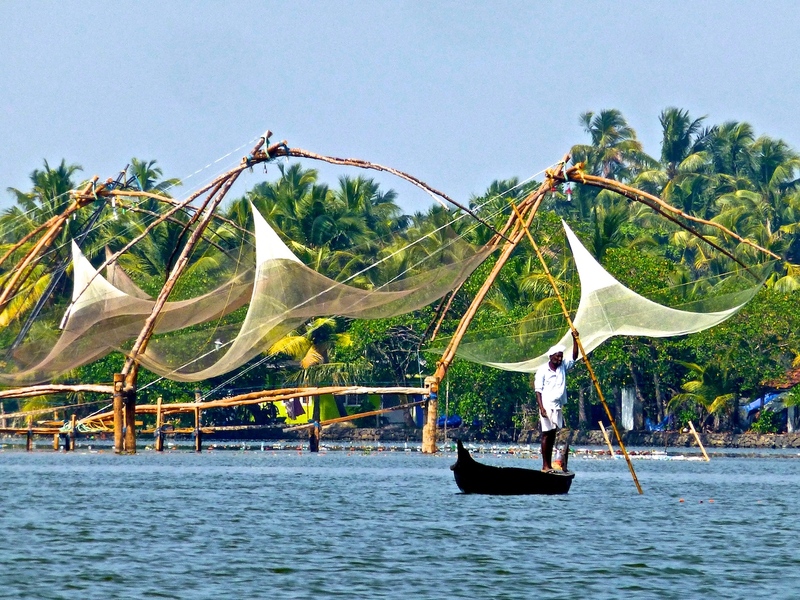 Stanley Wilson (tour operator out of Kochi who booked our backwaters trip) runs a 3 day / 2 night tour for Rs 11,000 that might be a good option if you want to be efficient and economical with your time. Activities: Popular activities include tea and spice plantation visits, the tea museum in town, scenic tours (e.g. to Top Station), trekking and visiting one or more of the region’s national parks and wildlife sanctuaries. The famed Neelakurunji plant grows on the mountainside here and flowers once every 12 years. My book says that late 2018 is the next bloom. Our jeep tour to Kolukkumalai cost Rs 1700. We had the jeep to ourselves and it could have seated more, though I do not know if the price would differ. We had to pay Rs 100 for a road maintenance fee on the way, and one can only imagine what the “roads” would be like without maintenance. At Kolukkumalai, it costs Rs 100 each to tour the factory. Eravikulam National Park is considered the place to see the nilgiri tahr. Chinnar Wildlife Sanctuary is also in the area. We read and heard that Periyar Wildlife Sanctuary may be disappointing. Attukad Waterfalls look impressive, though I think pictures you will see were probably taken in the rainy season. This entry was posted in Asia, India, Munnar, Uncategorized and tagged Casa del Fauno, kerala, Kolukkumalai, Munnar on December 28, 2013 by aleavitt77.